6:30 Walk in the door to an empty house. Andy is traveling. Girls have gotten rides to practice. Scan fridge. Some leftover bagged greens, a head of cauliflower, a vinaigrette I made on the weekend. The only meat we have is frozen. Not enough time to thaw. Scan the pantry. Jackpot: Two cans of chickpeas. Center-of-the-plate problem: Solved. 7:20 Pick up Daughter 1 at soccer. 7:40 Return home. Daughter 1 takes a shower. I chop cauliflower, add to a baking dish, and toss with olive oil, dash red pepper flakes, and salt and pepper. Roast for about 25 minutes at 425°F, along with some foil-wrapped Trader Joe’s Naan that’s been in the freezer for who knows how long. While this is happening, I drain and dump chickpeas into a hot frying pan with olive oil, some chopped onions, cayenne, garlic powder, paprika. (I always think of my friend Todd’s advice when making these: “Cook them longer than you think you should.”) I let them get nice and crispy while I toss the leftover greens with vinaigrette and make a quick yogurt sauce for the chickpeas. 8:15 Daughter 2 returns from soccer practice in her carpool. 8:20 Cleats off, hands washed. (I think?) Dinner. 8:23 Peanut butter jar is procured and spread across pita. More chickpeas for the rest of us. Add a generous amount of oil to a cast iron skillet set over medium-high heat. Drain, rinse and dry two 14-ounce cans of garbanzo beans. When pan is hot but not smoking, add beans (in batches, if necessary, or two pans — you want a single layer of beans on the pan’s surface). Fry about 15 minutes, tossing every 5 minutes or so. Remove with a slotted spoon onto a paper-towel-lined bowl. Once all chickpeas are fried and drained, add salt, pepper, a pinch of cayenne, a 1/2 teaspoon of both garlic salt, and paprika. While the chickpeas fried, whisk together about 3/4 cup plain yogurt with a teaspoon garam masala, lime juice, olive oil, chopped cilantro and/or mint. Salt and pepper to taste. Toast Naan and serve with yogurt sauce and chickpeas. Or peanut butter if that’s the way it has to be. P.S. What are the girls eating after school, but before practice? A Sneal, naturally. I find this post so amusing – I come across this problem all the time! I love having an extra ‘go to’ meal idea when I have 0 items thawed. Thanks! Looks good! In the timeline you mention onions but I don’t see them in the recipe. I’m guessing they get added with the chickpeas? Or do they go in after w/the spices? Or are they in the recipe and I missed them? Thanks! I LOVE the idea of “Last Night’s Dinner”. It makes it all seem so…possible! I mean, your recipes always seem possible, but, to me, execution in a timely fashion still seemed impossible. Now it makes sense! Yes to this new feature! OKAY, help me out here, Deb. I tried to fry chickpeas after reading your original article about them, but it was an explosive nightmare! Oil everywhere, chickpeas exploding like popcorn, me finally giving up and eating worms for dinner instead (figuratively). I checked the comments and apparently nobody had this problem but me. What did I do wrong? YES to last night’s dinner. Love it. Potato queen – I don’t know! (And who’s Deb?) Were you using canned chickpeas hopefully (and not dried). Maybe try lowering heat and making sure chickpeas are not just drained but dried? Could’ve been the liquid splattering. Not sure what to tell you. And glad everyone likes the “Last Night’s Dinner” conceit. It’s been happening for a while, just never made it formal. Oh! And yes, onions into the pan with the chickpeas towards the middle/end of cooking — if you do in the beginning on that high heat, they’ll burn. Is there anything better than Trader Joes frozen naan? I think not. We go through packs weekly! Looks super yummy and quick – perfect for meatless mondays! i love your blog and have your cookbooks . I have 3 kids who are starving by 5 pm after school. what are your kids eating between school and soccer or after soccer before dinner? by 830 pm we are on our way to getting ready for bed? Love this post Jenny! I’m always wondering what other people are eating on nights with so little time, especially on nights without something waiting in the fridge or freezer. This looks like something I typically do most nights, as a single guy who lives alone. A little improv, creative thinking and a reasonably full pantry generally do the trick. This particular recipe looks delish. Tonight I’ve partly thawed via microwave 2 Adelle Sausages I had in the freezer left over from a trip to Mt Rainier on Oct 4th that I’ll shove in the oven in a vintage 9×13 cake pan with a bit of water to cook/heat through and get some color. I have 2 new potatoes to cut into fries, which I’ll toss in Hungarian paprika, ground sage/fennel, and perhaps some Thyme, salt/pepper and olive oil to bake until crispy and golden and a quick salad to go with along with homemade quick buttermilk ranch. I love seeing how you can get dinner on the table quickly. While this won’t be that quick, it’s simple and I can work on things while the sausages heat/brown in the oven. The recipe looks like a surefire takeaway, but my favourite part was the toast with peanut butter and jam that was procured for ‘Daughter 1’. I find your approach to feeding children really inspiring and easy. Thanks for the honesty, and for sharing! OOPS! Deb = Deb Perelman = I was browsing too quickly between your site and Smitten Kitchen. Sorry, Jen! Yes, I was using canned chickpeas, but perhaps didn’t dry them enough. I wondered too about the heat and whether I should have used Medium instead of Medium High. I’ll have to give it another shot. Thanks for the response! We made these chickpeas and the yogurt sauce last night and had them over brown rice and roasted broccoli. SO GOOD! Thank you. And potato queen, I had one chickpea pop and go airborne, and that stopped when I turned the heat down a little. 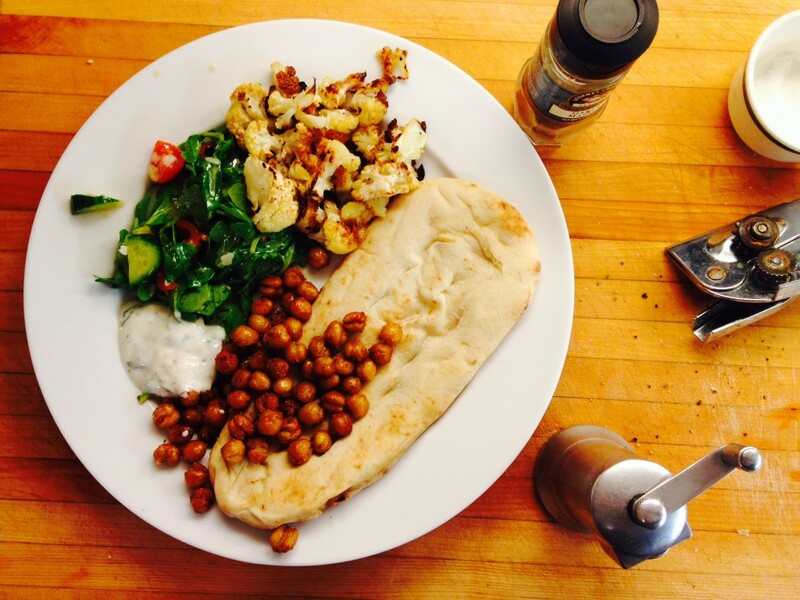 The spices you used with both the cauliflower and chickpeas sound delicious! (Hopefully your daughter will come around eventually.) I always find I discover the best recipes when I have the least amount of ingredients in my fridge/pantry. I’m in my last semester of grad school, and this recipe is such a welcome addition to my weekly rotation. Because I had roasted veggies from my weekend meal prep, it was simply a case of toasting the naan, frying the chickpeas and reheating the veggies. Super fast and filling!